At the moment, while the Altador Cup finals are raging and everyone could do with a short break, we came up with two nice ones for you! First, the results for our Altador Cup Customisation Spotlight are in! Congrats to all the winners and we'd like to thank everyone who participated! You've all come up with some very nice entries and have given us judges a hard time to choose the winners. Especially some lands like Fearieland, Darigan Citadel and Shenkuu were quite a challenge. Frames are all the rage this year! Also, we have a special congrats for Jello1987. Winning the spotlight for your land once is already quite a task, but this Zafara has done this twice in a row now! Besides the original Customisation Spotlight, there's also the Staff Customisation Spotlight. This time, you will be the judges! Vote in three different categories for which staffmember's Pet you think is the best customised one! 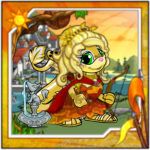 Wait, what happened to the Best Petpet Spotlight? I was all ready for it!